Hugo Jennings in Music on 9 November, 2016. It remains one of the most bizarre but entertaining conspiracy theories of all time. On the 9th November 1966, Paul McCartney supposedly died in a car accident. Fearing that this would hurt sales, The Beatles and various record company executives agreed to cover up the tragedy. Paul was replaced by William Campbell, winner of a Paul McCartney lookalike competition. For some reason, however, John Lennon, George Harrison and Ringo Starr decided to leave ‘clues’ to do with Paul’s ‘death’ in song lyrics and album covers. One of Paul McCartney’s cars was actually in an accident in January 1967. This caused some rumours to spread in London that the superstar had died. It later transpired, however, that the man driving his car was Mohammed Hadjij, an assistant to art gallery owner Robert Fraser. Paul was with Mick Jagger at the time, driving to Keith Richards’ house in Sussex. The “Paul is Dead” conspiracy really started to take off in the United States in 1969. Russ Gibb, a disc jockey, was doing a Sunday afternoon show on the radio when a university student called in and eventually told Gibb to play the ninth track on the White Album—‘Revolution 9’—backwards. When played normally, a man says “number nine” repeatedly whilst music plays in the background. Played backwards, the man can be heard saying “turn me on, dead man”. The phrase can be heard much more clearly than when most records are played backwards, and Gibb’s radio show received calls for the next few hours from listeners who’d discovered other “clues” in Beatles albums. The new story was that Paul stormed out of a recording studio on the morning of 9th November 1966 and subsequently died in a car crash. One version is that he picked up a female hitchhiker who, recognising him, wrapped her arms around him, causing him to lose control of his Aston Martin and crash into a fence. Unfortunately—and this is where things get truly surreal—he was decapitated in the accident and his corpse could not be identified even using dental records. The ‘clues’ are the most entertaining part of this conspiracy. It’s well worth spending an hour or two examining them because some seem like they could be true at first glance. What’s more, it’s a chance to get a much closer look at the Beatles’ weird and wonderful album covers and artwork over the years. The floral arrangement of the word “BEATLES” at the front of the Sgt. Pepper’s Lonely Hearts Club Band album cover makes it look like a funeral procession, with the gaggle of celebrities behind the four members of the band playing the role of mourners. An open palm is held above Paul’s head, a symbol of death in some cultures. On the right-hand side of the cover, an Aston Martin can be seen near a blood-stained driving glove. On the inside cover of the album, George Harrison seems to be pointing towards the lyrics “Wednesday morning at five o’clock when the day begins”—the opening to the beautiful She’s Leaving Home—the time at which Paul was pronounced dead. Perhaps the weirdest ‘clue’ of all is that if you place a mirror down the middle of the bass drum on the cover, it spells out “I ONE IX HE [arrow pointing upwards towards Paul] DIE”, which fans suggested meant “11/9 HE DIE”, which to Americans would mean the 9th November. The problem with this theory is that in Britain, ’11/9′ would mean the 11th September. The cover of Abbey Road is meant to be a funeral procession, too. John, dressed in white, plays the role of Jesus; Ringo, dressed in black, is a mourner; Paul, the dead man, is wearing bare feet, because, theorists claimed, in parts of Italy people are buried in bare feet (which is total nonsense); and George, dressed in denim, is the undertaker. This is only the tip of the iceberg of the ‘clues’ on Sgt. Pepper’s and Abbey Road, let alone other albums like The White Album and The Magical Mystery Tour, but it would require a small novel to recount them all. Most of the ‘clues’ have been refuted quite easily. For example, fans claimed that Paul is dressed as a Walrus on the cover of Magical Mystery Tour because “walrus” means “corpse” in Greek, which any Classics student will tell you is not true. 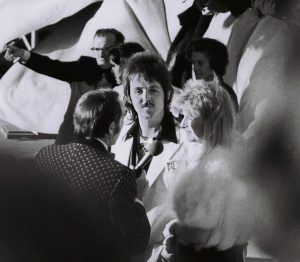 There is no evidence of a Paul “lookalike” competition ever being held, and it is unlikely that this “lookalike” would have the exact same vocals as Paul, let alone that he would have a 46-year long career after the break-up of The Beatles. The biggest problem of all, however, is that Paul was on holiday in France on the 9th November 1966. Nevertheless, this conspiracy became major news at the time. All of the Beatles, particularly Paul, were forced to deny his death at numerous intervals, and to this day some people believe that he is dead. This serves as a great example of how rumours can spiral out of control when music fans start to believe something. Who would’ve thought that a university student could lead millions of people to believe that a world superstar had died?